More than 11,000 dachshund fans turned up to cheer on the doxies Sunday in Kansas City for the 14th Annual Wiener Dog Nationals. 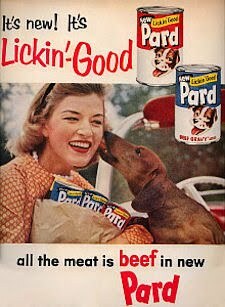 Corky, this year's winner, was the oldest dog in the race. Way to go Corky! Excerpt from The Kansas City Kansan: Corky, a former champion owned by Chelbie and Marty Glenn of Lawrence, went box-to-wire for a second title this year. The oldest dachshund in the race at 10 years of age, Corky covered the 110-yard sprint in a fast 12:16 seconds on a track made a bit slow by rain that fell later in the afternoon. Read the rest. Vanessa Carlton and her dachshund 'Victor' are pictured in NYC Friday on the set of her new music video for the song Nolita Fairytale from her new CD, Heroes & Thieves. Source: Celebrity Dog Watcher. Find out more about Vanessa Carlton at wikipedia. There were no photos with this story, and this isn't a picture of 'Wally D. Hund.' 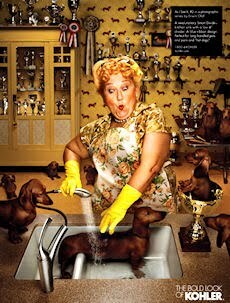 But what a great dachshund tale! 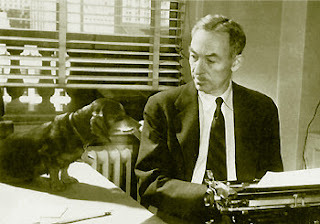 The author, James Lee Hutchinson, worked with Larry D. Bedford to provide the account as a guest columnist for Times-Mail out of Indiana: Sgt. Hund served with the 110 Military Police Platoon , Seventh Corps Headquarters, in Stuttgart, Germany, in 1960-64. Sgt. Larry D. Fortner of Bedford served four years in the same unit. He was well acquainted with Wally and provided the information for this story. Sgt. Wally D. Hund was the platoon mascot and the commanding general’s dog. 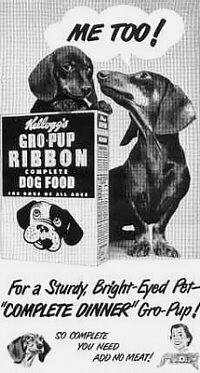 Hund was a black dachshund who had earned his stripes as a great morale builder. He proudly wore his sargeant’s chevrons on his uniform, which was a black MP arm band modified to attach to his collar and button under his long, fat belly. Wally had a weight problem because he loved a lot of hamburgers and a little beer. He roamed the base all day and bunked in the MP barracks at night. Most all the 48 soldiers in the platoon gave him treats and spoiled him rotten. Everyone thought of him as their dog, but whenever he became too fat, the general would take him to his own quarters for a week or two of dieting. However, he was back on patrol as soon as he regained his normal figure and able to move without waddling. It came to a head one summer day when the general happened to glance out his window and see Private First Class Elmer Dugan throwing rocks at Sgt. Hund. The general blew his stack and ordered a colonel to bring PFC Dugan to his office immediately. The soldier left the office without his one and only stripe. Private Dugan had been “busted” for throwing rocks. Dugan was only trying to get “Fat Wally” to move out of traffic, but it was three months before he got that lonely PFC stripe back. Wally moved into the general’s quarters again and eventually became a lean mean machine. In fact, he came so frisky that he ran off with a girlfriend who happened to cross his path. Sgt. Hund was AWOL for almost a week. Everyone was relieved when the bedraggled, but happy, dog returned to the base. But, he was in big trouble. Sgt. Hund was not courtmartialed, but he did face a demotion ceremony. Sgt. Wally D. Hund stood calmly before the formation on that dark day. His black MP uniform (arm band) was removed. He left the parade ground as Corp. Wally D. Hund. 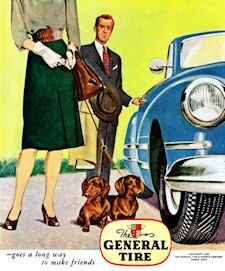 Of course, the general soon restored that lost stripe, and Wally continued his duties as morale builder. I’ll bet every man in the 110 Military Police Platoon remembers that demotion ceremony in Stuttgart, Germany, 44 years ago. Meet 'Fritz' the dachshund and 'Jane!' 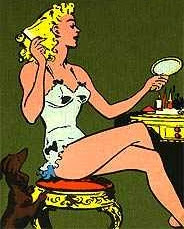 'Jane' was a wildly popular racy cartoon series in wartime Britain which Churchill dubbed 'Britain's Secret Weapon,' as Fritz and mostly Jane kept up the troops morale with their daily misadventures. 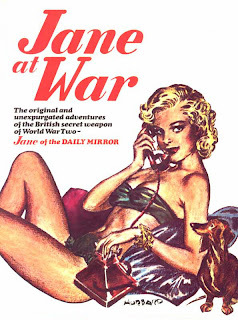 Excerpt from The Independent: Of all the Second World War forces' sweethearts, few were less likely than the risquee cartoon pin-up Jane, who had a knack for losing some of her clothes wherever she went. "Jane's Journal - or The Diary of a Bright Young Thing" opened modestly enough on 5 December 1932 in the Daily Mirror. It was the creation of Norman Pett, a freelance cartoonist for the likes of Punch and assorted children's comics, and was inspired by a telegram received by his wife, Mary - "EXPECT COUNT FRITZ VON PUMPERNICKEL JUST OVER FROM GERMANY CANNOT SPEAK WORD OF ENGLISH YOU'LL LOVE HIM." 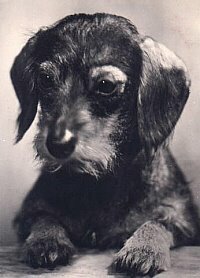 Fritz was a dachshund, who became Mary's - and Jane's - bosom companion. Pett drew from life and initially his wife posed for him. However, as Jane began to reveal ever-increasing amounts of flesh, the artist began to look for a new model. He found her at a Birmingham art college, posing for a life class: Christabel Drewry, a blonde former beauty queen and artist's model who became the very public personification of the character. 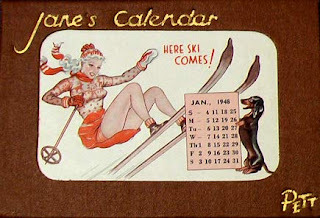 Read more about the Jane cartoon series. Obey the Dachshund! 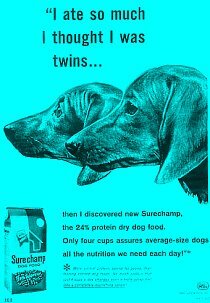 If you haven't seen the dachshund propaganda art over at Obey the Purebreed, make sure to check it out. 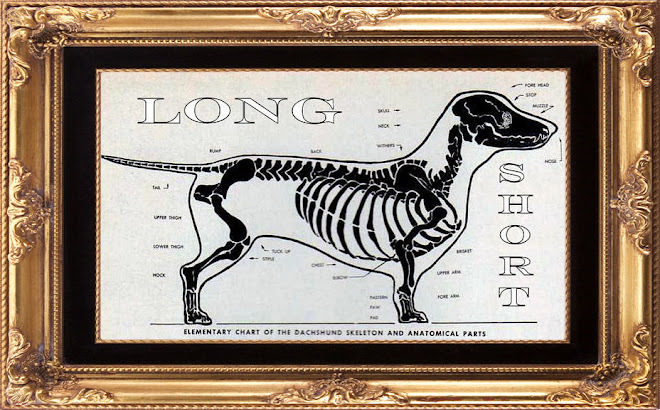 Artist Kevin McCormick has some fantastic work and adds new dachshund designs all the time. His dog news blog is also fun to read. Great stuff. Looks great framed. Tony Baker of Lake Park, Minnesota, dotes on his mini dachshund, 'BooBoo,' upon his return Sunday to Detroit Lakes after 22 months of military service, 16 of those in Iraq. BooBoo must be so happy to have his dad back. Read about the celebration of the troops return right here on In-Forum News. Rebecca Rapp, owner of pet supply store Cool Cats/ Hot Dogs in Ponchatoula, Louisiana, poses with the official store greeter, 'Clover,' who is a red long-hair piebald dachshund. Rapp also paints pet portraits right in the store. I'd go just to meet Clover! Excerpt from hammondstar: Most customers are approached by the store greeter when entering, who stands only a few inches off the floor and continually wags her tail. “Clover is our store greeter,” Rapp said of her Dachshund. “She rolls over and tells people hi.” Read the rest. 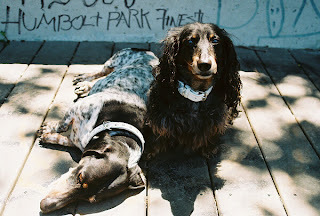 These are my two dachshunds, Joey and Maggie. They are littermates, and are 6.5 years old. 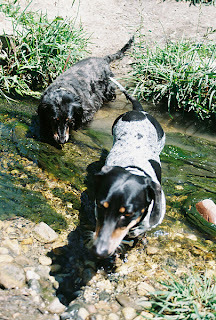 Joey is a black and tan smooth piebald male, and Maggie is a black and tan long-hair dapple female. It was a beautiful weekend in Chicago, and on Saturday we went for a long walk in Chicago's Humboldt Park. Check out the whole set of 30 pictures right here on flickr. "A boy and his dog" - Van Nuys, California, 1969 - Well, on select weekends he was my dog. Bootsie (note the white fur on his front paws) belonged to my grandparents. (He had a cousin, Tinker, not pictured.) This is in the parking lot of my dad's auto mechanic shop (let me tell you, having a mechanic for a father in L.A. is golden); that's the home of Grandma & Grandpa on the northern part of the lot. 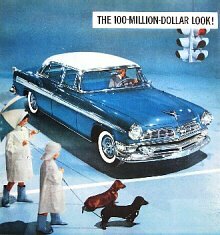 Note that it's not the puppy on a leash here; it's the car. Bootsie lived a long life, dying in 1983 at age fourteen. Gets me every time. 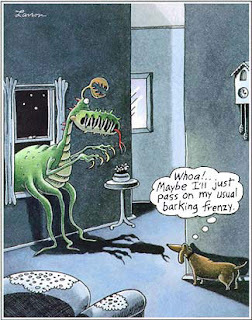 By Gary Larson. 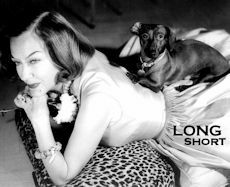 This is the late photographer Kamil Salah and his dachshund “Molly”. 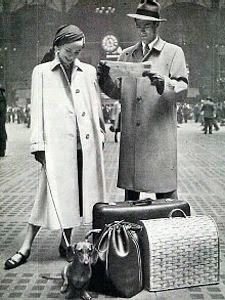 Kamil Salah was a photographer, fashionista, and dog-lover. His recently published book, "Celebrity Dogs" includes a forward by Bruce Weber, and photos of the glamorous pooches of Hollywood's A-List. Salah's own little girl 'Molly,' his favorite dog to love and photograph. 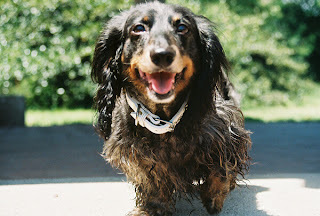 Check out his website for more dachshund photos. Ahoy Mate! Comfortable in a hot-dog costume, or relaxing on the open sea, the versatile dachshund never ceases to amaze. Photo by Jana Vackova for moderndog. July is National Hot Dog Month, and today is National Hot Dog Day according to the National Hot Dog & Sausage Council. It's the closest thing we've got to a National Dachshund Day, so get the doxies out and celebrate! 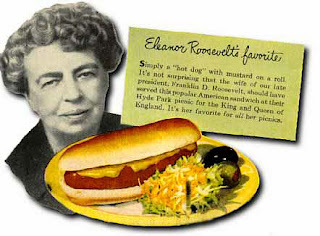 According to legend, the term “hot dog” was coined in 1901 when sports cartoonist Tad Dorgan was at a baseball game at the Polo Grounds in New York. Vendors began selling hot dachshund sausages in rolls and Dorgan could hear vendors yelling, “Get your dachshund sausages while they’re red hot!” He sketched a cartoon depicting the scene but wasn’t sure how to spell dachshund, so he called them “hot dogs,” and the rest, as they say, is history. Image source. Congratulations to Grace and 'Lily!' Excerpt from MPNews: Grace Davidson poses Thursday with her pet mini dachshund named Lily, after she won the junior division at the 4-H pet show. For Grace Davidson, winning the junior championship just added to an already successful fair. As a fourth-grader she could not send any of her 4-H projects to the state fair, so she earned three gold awards, one for a photo of Lily, one for M&M cookies and another for making cancer bracelets that she sold for the Relay for Life, held July 7 in Mt. Pleasant, as a cancer-fighting fund-raiser. Grace said that because Lily is so small, "she's easy to take care of." Read the rest. Excerpt from The Desert Sun: 'Ubor' the Dachshund looks up at Desert Hot Springs resident Jarred Fiorda, 10, after receiving 2nd place in small canines for a photo during the 8th Pets on Parade Awards Luncheon at the Doral Resort on Sunday, July 15, 2007 in Cathedral City, Calif. The 8th Pets on Parade Awards Luncheon benefitted Animal Samaritans SPCA "Low/No Cost Spay and Neuter Program" and the Pegasus Riding Academy for the Handicapped organization's "care of rescued and adopted horses". Proceeds are expected to be about $100,000. Read the rest. Meet beautiful 'Kane!' Oh, the stories that Kane could tell if only he could talk. He's 8 years old, and he's a happy, healthy, active boy. His owner recently died, and Kane found himself in a kill shelter in Southern Illinois with no prospects at all. "How did I end up here?" he must have thought. "Where's my dad?" Enter MidWest Dachshund Rescue. They coordinated his transport with three different volunteers through hundreds of miles in the state to one of their representatives near Chicago. I got to pick him up yesterday on his final leg of the journey towards getting that forever home. I got attached to him real fast, he's going to make a great companion to a lucky family. He'll get neutered and have dentals today. If you live in the midwest and are interested in such a great little guy, please contact MidWest Dachshund Rescue. This is a great little clip with dachshund 'Goeman' showing how he's 'livin la vida loca!' He plays soccer, frisbee, dances, and skateboards! His jacket and skateboard are even personalized! Can I get an autograph,....er pawtograph? 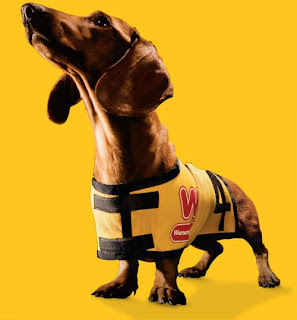 Best of Luck to all the dachshunds racing at the 12th Annual Wienerschnitzel Wiener Nationals today at Los Alamitos Race Course in Los Alamitos. The event should draw more than 10,000 people. Proceeds benefit the Seal Beach Animal Shelter. Last year's event raised almost $20,000. What an awesome pic by the way! 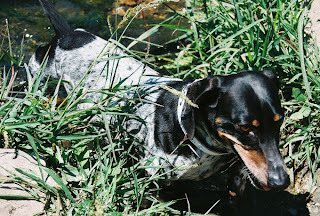 Read Buffy, the lizard-chasing dachshund's story. Read Roxanne and owner Corryl Kemp's story. You've probably seen the original video of Rusty the Narcoleptic Dachshund from some sort of educational film about narcolepsy (top video). But have you seen the music video? Sleep well Rusty. This happened about 5 months ago, but here's a great little news video which is fun to watch. From wsoctv: CATAWBA COUNTY, N.C. -- Emergency dispatchers in Catawba County got an unusual 911 call this week...from a dog. 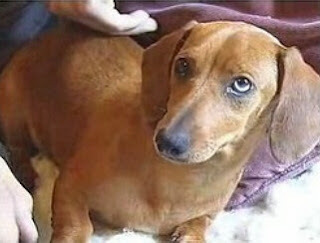 The seven-year-old miniature dachsund named Jake was home alone Tuesday night and managed to dial 911. The dog howled and barked as the dispatcher tried to figure out what was happening. Long View police responded to the home and found the dog and his owner inside. Jake's owner said he's not normally left alone and planned to put the phone out of reach from now on. What a great bonding experience for 'Paige' and her mom! Excerpt from the Chetek Alert: Hazel Sinclair of Minnetonka, Minn., and her walking partner, Paige, a miniature dachshund, recently walked over 250 miles across the state of Wisconsin in order to raise awareness for Huntington’s Disease. So, she and Paige walked. And they walked. And they walked. Down county highways, past farmers' fields, at a pace of seven to 10 miles per day. Sinclair says she has raised about $3,200 to this point stemming from her long walk, a lot of it due to her constant, yet diminutive, traveling companion. "She was an outstanding ice-breaker for me," says Sinclair. "People would stop and say, 'Oh, look at the cute puppy,' and that would get us started talking about our walk. The people would then ask about the walk, and that would give me the chance to talk about HD. I got quite a few donations that way." Read the rest and see an additional photo. If you are interested in contributing to Hazel and Paige's fund-raising effort, please visit First Giving. 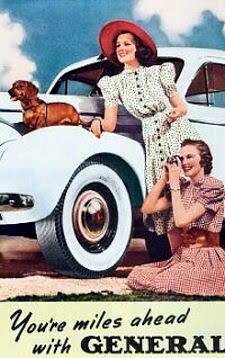 What a great family activity, and what beautiful doxies! 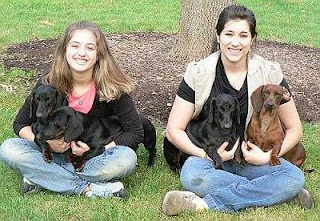 Excerpt from the Lake County News-Sun: Leah Tedesco, 16 (right), holds Prince Leopold and Honey. Her sister Olivia, 13, is shown with Fenway and Guiness. In her new book, "Junior Showmanship: How to Get Started in One of the Best Family Sports," dog-showing enthusiast Leah Tedesco, 16, outlines her practical approach to entering the world of dog showing and competing for kids ages 9 to 18. "As far as I know there are no other books like this, which explains just how a child can get into the sport of handling. Most books are about how to win, but the sport is much more than that. It's a great way to bond with your dog and spend time with your family. I am trying to give a broader view of the sport," Tedesco explained. Read the rest. The book is available for $6.95 from http://www.dogwise.com/ and http://www.amazon.com/. If you're in the Midwest this coming weekend, why not come to Chicago and play with some dachshunds on Saturday at a Doxie Luau! 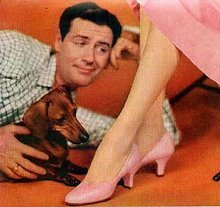 It's Chicago Dachshund Lovers July meetup on the 14th. Forecast: Sunny and a comfortable 75 degrees! It will be indoor/outdoor at a great facility; there will be potluck, wading pools, Hawaiian music, leis for the doxies, a door prize, surprises, and lots of doxies to admire! Just shoot me an email and I can send you all the details! Stupid Pet Trick? Willie's got attitude! Watch the video and meet Willie, the self-crating dachshund right here on DAVETV. 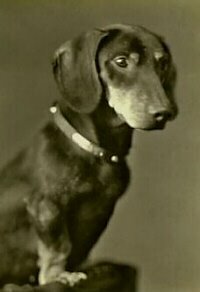 It sounds like 'Lillie' the dachshund was a mother at a previous time, but not sure how long ago from the story. 'Tahoe' was a stray kitty luckily found in the engine of the family car! There are also video and audio clips at the link. Excerpt from the Victoria Advocate: "We kept him in our bedroom," Eunice Collins said. "I woke up four days later and he was nursing on Lillie. I couldn't believe it." Today, Tahoe and Lillie hang out, nap and cuddle together. In the mornings, at night and following naps, Tahoe rolls over and feeds from Lillie, purring and pawing at his new mother's belly. Lillie lays still, content to be a mother again. "She's a good dog," Beck, the veterinarian said. "Having Tahoe around induced a false pregnancy, a nursing response. It made the hormones needed to produce milk. Now, I'm sure the cat obviously had it in her mind the dog was her mother." 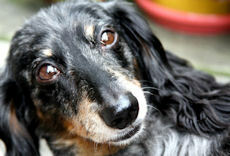 Eunice Collins said, "Lillie is a very loving longhaired dachshund. She has just taken Tahoe on as her baby, and has been nurturing and taking care of him. They're just very close." Read the rest. Rommel will be sorely missed! From Reuters: TOKYO, July 5 (Reuters) - Japan are bidding for a third straight Asian Cup title robbed of their secret weapon now that team mascot Rommel has retired from active duty. 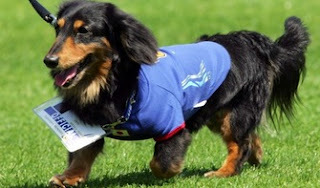 Miniature dachshund Rommel, or Ron for short, was once Japan's lucky charm, his talismanic presence said to be behind the team's 18-game unbeaten run before the 2006 World Cup. But after Japan's meek exit from the tournament Rommel was stood down by his owner, Japan Football Association's chief media officer Hideto Teshima. "That unbeaten streak was always going to end in Germany," Teshima told Reuters in an interview. "You can't really blame Ron. Japan weren't going to win the World Cup. The time was right for him to walk away. He's about 13 now, which in human years is 91. He's getting on." Ron, dutifully decked out in his trademark kids-size Japan shirt and with his own official accreditation hanging around his neck, enjoyed four years of red-carpet treatment. Read the rest. Brett Butler is a former center fielder in Major League Baseball who played for five different teams from 1981 to 1997. This is a 1993 trading card from a limited edition set of players and their dogs. Brett is pictured with his doxies Beenie and Cecil! Find out more about Brett Butler at Wikipedia. Follow-up on Previous Post. Make sure to check out the video of cart doxie 'Asher' crossing the finish line at the link! Excerpt from WCSH6: WEST MIFFLIN, Penn. (NBC) -- Dozens of dachshunds were on hand, or paw, to vie for glory at the annual Wiener 100 on Tuesday. Defending champ Coco won the eleven pound and over crown, while Sadie Lady took home first place in the miniature category. The wheelchair-bound crowd favorite Asher came in last, but was still rewarded with a hearty round of applause. Read the rest, and see the video. This story is a bit disturbing. Thankfully at least 'Jasmine' is home safe! Excerpt from KTTC: ROCHESTER, MN -- It's a dog-napping case with a happy ending; a pup is reunited with her owners, but not before police have to step in. And while it may seem like a simple story, for the couple it happened to it was anything but. In fact they are so afraid of the dog nappers coming back to retaliate, they don't want to release their last names. Jasmine is a happy go-lucky miniature dachaund puppy, glad to be reunited with her family. She ran out the door when Jason and Katie were moving some boxes Monday evening. "We couldn't find her. We walked around asking everybody if they'd seen this dog, and one neighbor had seen a four door domestic brown vehicle older style," says Jason. Read the rest. Keep your doxies safe this 4th of July, and don't let this happen to you! This video is a tad disturbing. Have a fun and safe holiday! Excerpt from the Houston Chronicle: Penny Hann and grandson Chase, 6, sit in Hann's Pasadena front yard, chained by the neck to a doghouse Monday. Joined by Mitzi, her dachshund, Hann sat at least part of the day in the rain. Despite the steady rain that fell on Pasadena, Penny Hann sat in her front yard Monday and did what she had promised: chained herself to a doghouse. "I said I would be out here in rain or shine," she said. "So here I am." Although she was under a blue canopy, water leaked onto Hann, one of the 104 people in 34 states who planned to chain themselves to doghouses in protest of the practice of keeping dogs on chains. "It's very inhumane to put a dog on a chain," she said. "They're pack animals and they don't understand why they can't be with the rest of the pack." Read the rest. Excerpt from the Post-Gazette: Asher the dachshund gets around with help from the wheels fitted to PVC pipe by his owner, Laura Schumm. Asher will be competing today in Kennywood Park's annual "Wiener 100" race. Marathon races have their wheelchair competitors as well as their disputes. Now the Wiener 100 has them, too. That would be the dachshund race at Kennywood Park. Its third annual installment is today at 3 p.m. And among its entries is Asher, a disabled 2 1/2-year-old who scoots around in a specially fitted wheelchair cart supplied by his best friend and owner, Laura Schumm. "It's our first time for a handicapped dog in the race," said Kennywood spokeswoman Mary Lou Rosemeyer. Read the Rest. Oh my! Thanks to Susan N. for sending in the cartoon! Great to hear that 'Brody' is OK! 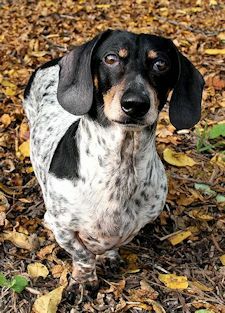 Excerpt from Westport Now: Hours of anxiety over a missing Dachshund ended happily early today after Westport firefighters rescued the animal from an abandoned well where it had been trapped overnight. The dog’s owner, Pam Nistico, said she had walked 1-year-old Brody late Saturday night and then returned to her home on the grounds of her family’s Red Barn Restaurant, 292 Wilton Road. When she put him down, Brody playfully chased after the family cat. After a while, Nistico became concerned when she could not find Brody. She and her daughter, Desiree, 19, and a friend searched frantically on nearby streets. They called Westport police for help and even spotted a state trooper on the nearby Merritt Parkway where he had stopped a speeder and asked if he had seen the dog. The trooper used his flashlight to look into the woods off the parkway. but Brody was nowhere to be found. Frustrated, they gave up the search at about 2:30 a.m.
Then at about 5:30 a.m., Nistico went outside again. “I whistled as I do to attract Brody and the cat,” she said. “I then heard a weak whimper.” It was coming from an abandoned well on the property. She called police who summoned the fire department. Firefighters determined that Brody had fallen through the deteriorated plywood covering the 4-foot-deep well and had landed on the bottom, said Assistant Chief Gene Maloney. “He offered the dog cookies, wrapped the dog in a blanket and carried the dog out,” Maloney said. Brody was uninjured but jittery, rescuers said. At one point, Brody “attempted to bite the hand that fed him,” Maloney said, but Scalzo’s protective gloves prevented serious injury. Nistico said she was deeply grateful to police and firefighters who helped her find and bring Brody back to her. “They were all wonderful—just great,” she said. Nistico, who had recently put an 18-year-old Dachshund named Bubba to sleep, said she adopted Brody after spotting him the Internet. The dog, then 7 months old, had been abused and was looking for a home. 15 seconds of terror in Tokyo. "While enjoying a quiet coffee on shinjuku dori this afternoon I witnessed several (seven?) dachshunds in a barking altercation with two rival dog-gang members in a vehicle. It was frightening." Excerpt from the Journal Gazette/Times-Courier on local obedience classes: The group puppy classes appeal to owners of small and large dogs alike. “Apple” is the Dachshund puppy of the Owen family of Mattoon. “She’s really good when people (visit) now,” said 11-year-old Izzy Owen, who attended the class with her mother, Dawn Owen. Way to go Apple! And thanks to Gwyneth Paltrow and Chris Martin for starting the whole "Apple" thing. Ahem.